Understand what drives visitor behavior, identify aspects of campaigns that work and alerts about issues you need to address. QleeQ™ presents several compelling subscription packages for organizations and Decision Makers that enable the best utilization of our offerings. The packages are a function of how many users and how many monthly queries needs to accomplish the goals. QleeQ™ has two services - QleeQ Focvs™ along with QleeQ Intelligence™ - that enables customers assess how visitors perceive and experience your brands, products, company, reputation and interests as well as your competitors’ and co-operators’. We add trends and insights as well as free Natural Language queries. QleeQ™ products presents a unique approach - no boundaries. We always look at the big picture - the biggests possible - the entire Internet. QleeQ™ products are "Sensing" the Internet and presents the "Internet's Common Opinion" - about regarding any topic of your choice. QleeQ Intelligence™ is the world's first web service that tells you what is considered True on the Web, based on our Worldwide Credible Digital Sources. QleeQ Focvs™, an online dashboard tool for Business and Competitive Intelligence, designed for Decision makers and provides sophisticated detailed insights into how prospects feel about your business, products, people and much more. Future and Action Items are the most innovative aspects of QleeQ Focvs™ with which you can look into the future and future trends. QleeQ Focvs™ enables track of marketing campaigns, Brand increase progress and to optimize them in near real time. QleeQ Focvs™ is innovative and second to none in the idea and implementation. 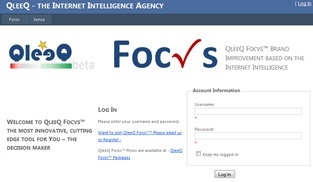 QleeQ Focvs™ focuses on the issues that you the decision maker need to further investigate. You don't need to search for the challenges - We do that for You! QleeQ Focvs™ is a fully automatic, unbiased, credible system that summarizes the web and provides the Internet Common opinion. The benefits achieved via QleeQ's advanced analysis mechanism that deducts the Intention and wisdom of billions of articles and information in a matter of seconds. QleeQ Intelligence™ is a system designed to inquire about the Inernet Common Opinion about every issue and automatically presents a simple scale about the answer. Queries like "X is better than Y" or "Z is the best" and many more. See blog post for more advanced options. We believe the Internet has a wisdom waiting to be used however, the overwhelming amount of data makes it a challenge. QleeQ Intelligence™ harness the Internet data and calculates the Internet Common Opinion about your query. QleeQ Intelligence™ enables users to enter a query about everything (we call it a Sensetence™) and receive an immediate automatic visual scale answer of the Internet Common Opinion. A Sensetence™ is - a thought, an opinion, a hobby, a fact, non-fact - everything. The answer is based on state-of-the-art, cutting-edge patented based algorithms, that mimic the users' intention and use Linguistics, Semantics and understandings. We believe the Internet has a Wisdom power that can answer questions, detect intention and present opinions about every issue. QleeQ™ harness that power and answer Natural Language queries automatically, simply and quickly to assist in decision making w/o neither surveys nor searches nor spending much time and money.